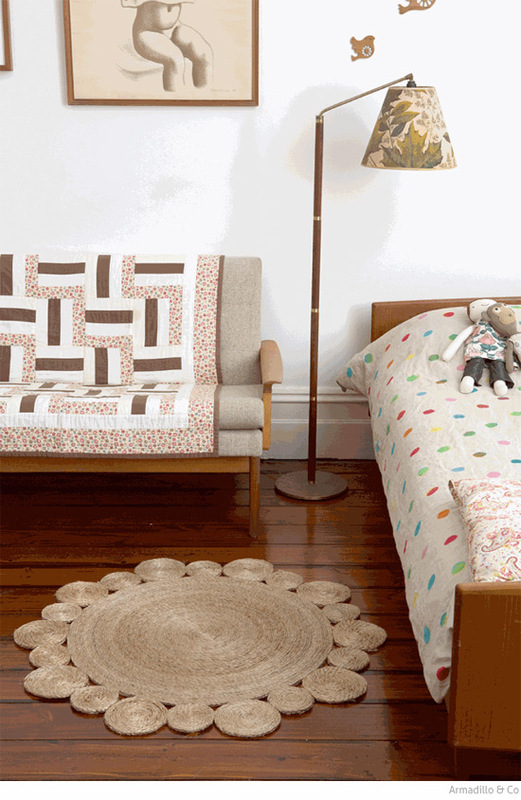 Here's something I have been waiting to share with you for a long time - fabulous fairtrade rug company Armadillo & Co has just launched their Junior Collection for kids and it's amazing. 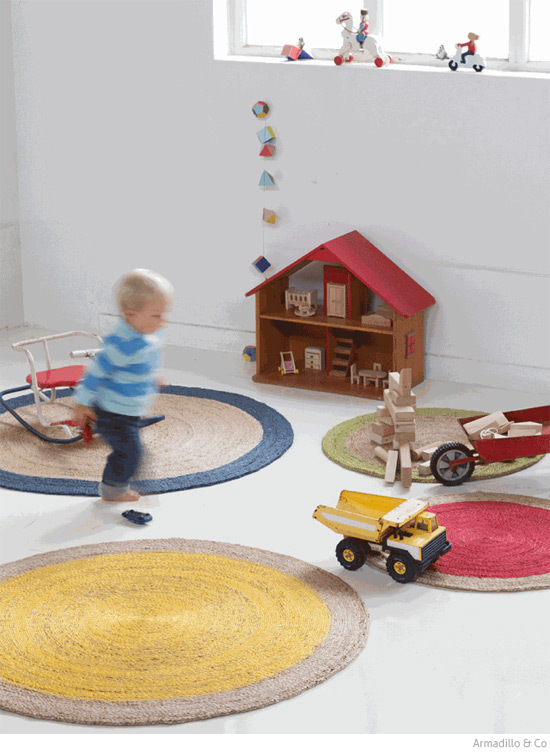 The collection includes classic stripes, colourful circle rugs, and the super-popular Armadillo & Co signature flower-shaped rug. We have the mini dandelion and it's gorgeous! Perfect for a child's room and also a smaller adult space. Note the IKEA PS 2012 quilt cover and the Trio of Wall Birds wooden wall decor by Naomi Murrell! I spy an adorable Herbert and Friends pirate cushion, and the Flying Machines art print by Printspace. Isn't that Kombi van cushion great! Curio & Curio/Two Ruffians had a similar design a while ago. 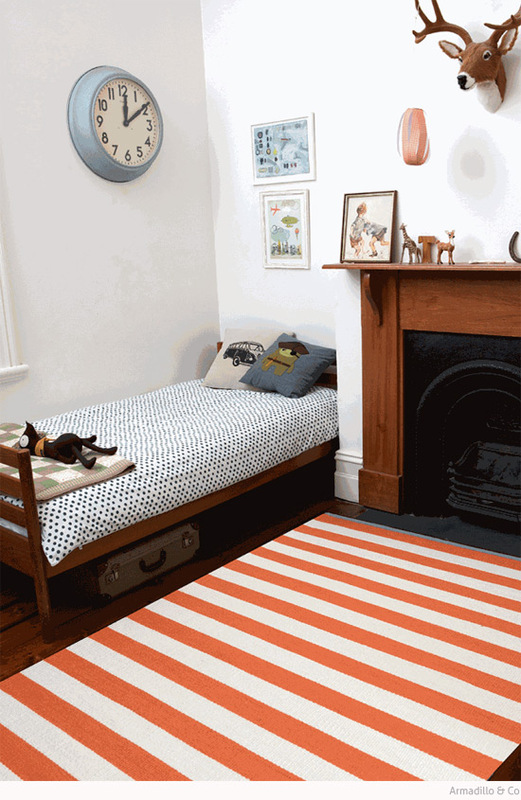 The Armadillo & Co rugs are handmade from soft hemp and pure wool in hardwearing weaves. The rugs are made in collaboration with artisans in India and are created under fair trade conditions. Head to the Armadillo & Co websiteto read more about the company's charitable operations in India. The company has a long tradition of working with local communities, through founder Jodie Fried's previous company, the much-loved Bholu. The Junior Collection is launching on 1st August 2013 and available by preorder in the online store soon and at these stockists: An Inside Story (NSW), Stone & Grain (VIC), Southwood (VIC). Oh my. These really are beautiful. I bet they feel so good under foot (or lying on to read stories and do colouring-in / blogging). Now, all I need is a house and a bedroom. Can you jiffy that up for me as beautifully! 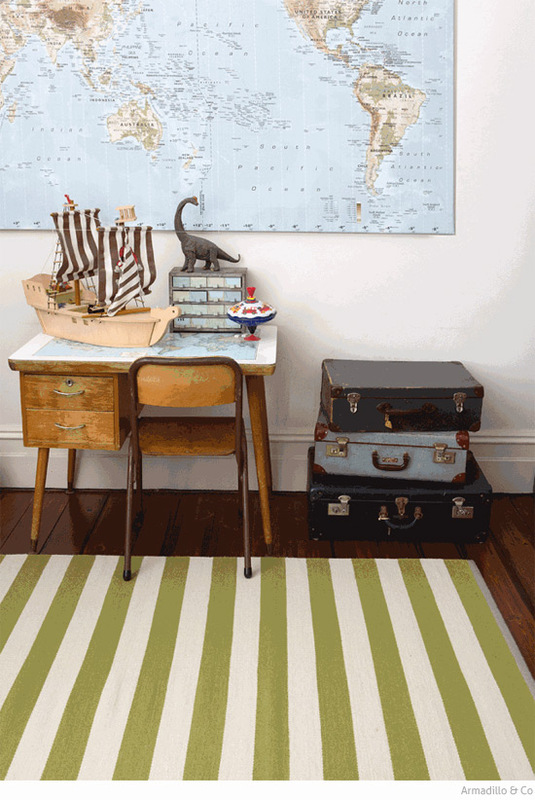 These are some lovely rug ideas for the kid’s room. Kids love colourful items.